One of the finest, and most memorable, distillery tours that I’ve been on was at Highland Park. It was a few years ago and our guide at the time was ridiculously knowledgeable and, as a result, wonderfully entertaining. At the end of the tour, the group was led into the tasting room where he poured a number of single malts, some of which were truly delicious. We appreciated the whisky; it spoke for itself and, over the course of three hours, our guide never once mentioned the Vikings. Regardless of whether the whisky is any good or not, this whole Viking thing is starting to wear a bit thin. The latest travel retail releases – a trio of bottlings – are apparently ‘inspired by iconic animals in Viking culture’. Just a bit tenuous and exaggerated? Names such as ‘Spirit of the Bear’ do more to conjure up images of a monthly club night at a Brussels gay bar than they do of the islands’ Norse heritage. It’s not that I haven’t been a fan of the distillery bottlings. After the aforementioned tour, I bought myself a bottle of the 18 years. A bit pricey – £90 I think – but I liked it and, as I was on holiday, I wanted a wee treat and was happy to pay that much. Also, I was always a fan of the Dark Origins release. Admittedly, I haven’t tried all of the recent releases but that’s because the ones I have tried have been a series of letdowns – for the price – so I’ve simply avoided the risk of further disappointment and chosen to spend my money elsewhere. 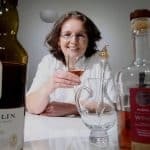 These days my advice, to anyone who asks, is to either stick with the 12 year olds – it’s a good value everyday sipper and there are often some great deals in the supermarkets – or find an independent bottling. It just so happens that I didn’t actually find this particular independently bottled Highland Park; it found me. It was given to me, about two thirds full, by one of the members of the whisky group I organise because ‘she didn’t get on with it’. Unfortunately, there aren’t too many people like this in the group. Knowing that this particular individual is partial to a drop or two of Highland Park, this in itself intrigued me. Why would a Highland Park fan not get on with this? Virtually all of the spirit destined for Highland Park’s single malt proprietary bottlings is matured in sherry casks (with Full Volume, an 18 year old limited edition, being one recent exception). This bottle, from Gordon and Macphail, is from their Cask Strength series. It’s young-ish; distilled in September 2007 and bottled in November 2016 making it a fairly youthful 9 years. With no sherry cask influence at all, it’s bottled from a vatting of six casks – the numbers of which appear on the label – which were refill bourbon barrels and is 58.8% abv. On the nose: green apple initially; lemon icing; Sprite; petrichor. With a few drops of water, the earthiness comes to the fore followed by grilled pineapple; a slight hint of tobacco; sherbet; lemon bonbons and custard cream biscuits. In the mouth: hints of apple and green grapes and not much else until adding a few drops of water. Then there’s white pepper initially followed by more green grapes and ripe bananas; gala melon; Malted Milk biscuits; it becomes slightly bitter into the finish where the smokiness emerges. This is light, fresh and really quite enjoyable. It doesn’t have the slight hint of burnt rubber that I traditionally associate with Highland Park offerings but it’s none the worse for it. Looking on The Whisky Exchange and Master of Malt, I can see that this bottling is no longer available. However, on the latter, it retailed for £51.16 which I think was a decent price for this cask strength whisky. 7/10 = Very good. Might um and ah over buying a full bottle if the price is high, but you can buy a glass with confidence. If it’s under £50, take a punt.